Can’t Attend? Say “yes” to adoption with a gift! Gift of Adoption is celebrating National Adoption Awareness Month and its 20th anniversary in a big way. Throughout November, Gift of Adoption will host adoption awareness and celebration events in 30 communities across the country to recognize and celebrate families and the volunteers and donors who are committed to uniting more children with a forever family. Each of the 30 events will feature one-mile walks to represent the final mile in a child’s adoption journey, followed by a community celebration. 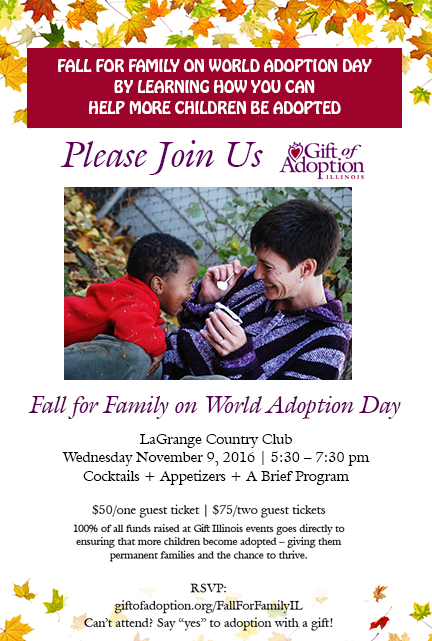 Gift of Adoption invites those touched by adoption and all who care about improving the lives of children to join us in the events. Gift of Adoption is a volunteer-driven charity that raises funds to provide adoption assistance grants to complete the adoptions of vulnerable children – giving them a permanent family and the chance to thrive. If you believe having a loving family is the basic right of children everywhere – join us to learn more! You don’t have to adopt to give a child a loving home. Since the first Gift of Adoption grant was awarded in Illinois in 2001, the Illinois Chapter has awarded $194,750 to unite 75 children with their forever families in Illinois. The chapter has also awarded $922,982 to unite 290 children with families in states where Gift did not have chapters.